Nestled between the bustling excitement of downtown Branson and the serene Ozarks environment of Thousand Hills Golf Course, Thousand Hills The Champions Resort in Branson MO provides guests with a uniquely wonderful Branson experience that allows for the ultimate vacation of relaxing and recreation. Play a round on the Thousand Hills Golf Course, take a dip in the refreshing and enormous community pool, or simply bask in the comfort of your own private, spacious home away from home. These properties also feature full kitchens with top-tier appliances and ample counter top space, as well as impeccable views, open-air decks, and jetted tubs. Community amenities also include a pool, playground, tennis court, and a fitness center, on top of the golf course. Don’t miss Branson’s spectacular live shows, which feature music, variety, comedy, stunts, and more! Feast at the fine restaurants located downtown, or stop by the premier boutiques at Tanger Outlets or Branson Landing. Branson Landing has the added benefit of being located along Lake Taneycomo and hosting an exciting fountain show set to music and lights that goes off every hour during operational hours. 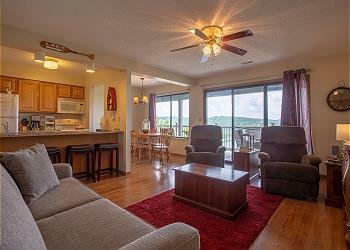 Table Rock Lake is not far from Thousand Hills The Champions Resort in Branson. Here, visitors can fish, swim, dive, and ride all sorts of watercraft, from boats and kayaks to paddleboards and more. Just visit one of the many state marinas to rent equipment or charter a tour! Silver Dollar City is also located just a short drive away from Thousand Hills The Champions Resort. Enjoy Ozarks-style family fun for all ages on roller coasters, amusement rides, and at the live shows. Contact the hardworking members of our reservations team, who will be more than happy to lend you their Branson vacation expertise when you book your trip accommodations in one of the lavish vacation rental properties that are available through Sunset Nightly Rentals for your stay today!